Russian and European grocery store. Russian European Food. Full Catering Services. Since its inception the Goffle Road Poultry Farm has adhered to Free Range Poultry methods, prohibiting any use of steroids, antibiotics or animal by-products in its operations. All Goffle Road Poultry Farm products are home grown and naturally processed. We hope you will visit our poultry farm where you will be served by professional and courteous people. Since 1991, the family-owned restaurant, Krichians Grill and Bistro has prided themselves on the preparation of authentic Middle Eastern and Mediterranean food using only the highest quality ingredients at a reasonable prices. Great choice and selection of nuts, chocolate, coffee and dry fruits. Gift baskets. Fresh European and American groceries! Great price. Hot and cold dishes for all your family! Kosher meat: always fresh! Beef, pork, lamb,goat, chicken. Russian grocery store. Products and presents at one place! Established in 2003, the Balady brand has become a well known source of fine quality products distributed throughout the country, and is proud of its notable 95% fulfillment rate. Russian delicacy: fish, meat, sausages, dairies, cheeses,drinks, fruits, vegetables, seafood, baking goods, pastry, chocolate and much more! 10 % discounts for seniors every Tuesday and Wednesday. Vitamin store. Natural Vitamins and Food Supplement. Also Sugar Free and Salt Free Products. Shipping Available. Russian Grocery Store. Our quality will surprise you! Grocery Store. Wide assortment of products. Fruit and Vegetable Markets in Brooklyn. Erics Health Food Shoppe sells only natural, organic, and eco-friendly products, products that support healthy bodies and healthy communities. Kaluga Caviar, Oscetra Caviar, Bulgarian Oscetra, Siberian Oscetra and Italian Oscetra, Servruga, American Sturgeon Caviar, Salmon Caviar, Trout Caviar, Smoked Salmon, Smoked Trout, Foie Gras, Blinis, and more. Kosher Bakery. Russian and American technology. A great choice of baking goods. Popular Russian Food Stores in Brooklyn! Russian grocery store: you can find here everything you want to! Russian grocery store: great choice and excellent quality! Russian meat and sausages market. Great choice of meat,sausages, cheese and fish. Special offers every day! Grocery store, specializing in seafood delicacy. Everything you need from kilka to calamari! Welcome to our Russian food supermarket, where you can find any kind of Russian Food groceries, fish, seafood and even the famous Russian caviar. Nothing can be compared with the original Russian taste of or sausage with the Buckwheat porridge that is right here, in our Russian food online store! Russian food is great on a variety of berries and nuts, mushrooms, fresh and tinned vegetables. What about some famous Russian sweets and "Morses" made of fresh berries and nuts that traditionally were a part of the Russian cuisine? Are you already intrigued by the authentic Russian food? Our Russian food grocery will satisfy everybodys taste! If you are a lover of the Russian food and culture, or, at least, are fond of the delicious Russian dishes, you will be really pleased to sit in a family circle over a cup of hot Russian tea and taste the Tula Honey Cookies, that we call Pryaniks! Russian Restaurant offering you traditional Russian dishes. Fish Market: seafood and fish delicacy. Food Market: vegetables, fruits, greens and much much more! We are a truly international market in the heart of Brooklyns bustling district - Kings Highway. We carry all type of food products from over 100 countries around the world. Pick any exotic tea or sweet or fill your bags with basic produce, we got it all. Russian grocery store in Charleston. Russian products, food, baking goods, fish and meat. Only fresh and delicious! We are your local European Food store. We specialize in a variety of European foods, such as Polish Kalbasa, German Bologna, Hungarian Salami, German Chocalates and Bread, Russian Pelmeni and other European Delicasies, Coffee, Dairy products from famous "Happy Cow", delicious juices and much more. 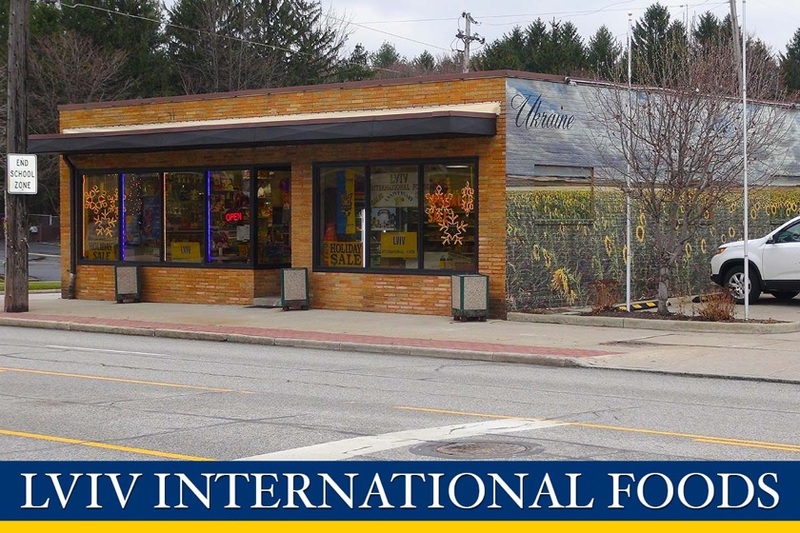 International Food and Deli - always fresh and delicious. Privately owned bakery. Enjoy our fresh and delicious bread everyday! Russian, Ukrainian, European grocery store. Mayfield Fine Foods is a russian food store located in Cleveland , Ohio. Our store specializes in Russian and Eastern European foods and products. State Meat Market Inc. Is a family owned and operated for over 35 years. Located in the Ukrainian Village in Parma, it is without a doubt the best place for a place to shop for an assorment of meats (fresh and smoked), pierogies, cabbage rolls and many many more ethnic treats. Nothing beats walking into State Meats and having that aroma hit you, your already starving, but your in luck because the smiling employee behind the counter happily greets you with a tasty sample. В нашу продукцию мы не добавляем ненатуральные пищевые добавки. Также предлагаем уникальные дрожжевые, слоеные и другие виды теста для выпечки. Ukrainian, Russian, Uzbek and Jewish cuisine. We have 25 years of experience on fish curing by smoking! N the market for something different? Something you might not find at your neighborhood grocery store? For twenty-five years, Buford Highway Farmers Market has been in the business of providing that…and more! When we opened our doors, we specialized in all types of Asian foods, especially Korean. Since then we have grown and diversified our offerings to include foods from Mexico, Central and South America, the Caribbean, West Africa, Japan, China, Thailand, Vietnam, the Philippines, Eastern Europe and more. Youll find more ethnic food varieties under one roof than any other single-location grocery store in Atlanta. Russian grocery store. Family business since 2000. We always glad to see you! Russian grocery store in Atlanta! European delicacy: fish, meat, sausages, dairies, cheeses,drinks, fruits, vegetables, seafood and much more! The first international grocery store in Boston, which is now famous retail chain under the name Bazaar. Bazaar West is 7000 square feet of retail space, more than 10,000 different products from around the world, always fresh fruit and vegetables, which we import every day! We are always here for you to provide with your regular food as well as introduce to something special that you will definitely love! Baza is open every day regardless any holidays for you to have everything you need on your table with no hassle. We offer catering service, from large weddings, bar and bat Mitzvah, to small family birthday parties and barbecue in your back yard. The bread we bake and distribute is all natural, and made from an old recipe that was perfected in Eastern Europe. We currently offer seven unique varieties of bread as well as a hand braided challah. Please, enjoy our cheffs delightful delicacy! You can order cooking and food for office or your family. We are organizing fantastic parties up to 40 people, where music is only for you. Groceries and delicacy from Europe. Russian grocery store. Home-made cakes, oil from Russia, wine from California, beer from Baltika, baking goods and much much more! We have a wide selection of authentic imported foods from Belarus, Bulgaria, Czech Republic, Denmark, Finland, France, Germany, Greece, Hungary, Poland, Russia, and Ukraine! We are celebrating our ten year anniversary of our home in Nashville. Alef Sausage Inc. Founded in Chicago in 2000, Alef Sausage Inc. Has grown to be one of the most well known and respected European style sausage companies in the United States. We present a new concept of the deli, where everything is in one place. It is unlike any store you’ve ever been to. We think thats a good thing, because we’ve gone above and beyond to choose the freshest high-quality foods from just about everywhere in the world. Be it Jewish dark rye bread from the local bakery, mozzarella from Italy, olives from Greece, brie cheese from France, zeppelins from Lithuania, borsch from Ukraine, pelmeni and blinis with red caviar from Russia, potato latkes from Belarus, or tortillas from Spain. Antons Fruit Ranch is an upscale specialty store focusing on fresh produce, including a salad bar, bakery, deli and hot food bar. We offer a variety of gourmet foods and cater to a niche market with our unique, top-of-the-line items. Grocery store - culinary. A wide choice of groceries that you lnow and love. 40 years of experience. Fresh baking goods every 20 minutes! Fresh fruits and veggies, juices,kosher food. With over 35 years experience in the food industry, we pride ourselves in our quality, cleanliness, prices, variety and customer service. Our goal is to provide great quality products at an affordable price. Fresh Produce. Unbeatable Prices. Full Experience. The shop offers a wide gourmet selection of desserts, cakes, pastries and breads, as well as a carry-out menu for lunches and dinners. In addition, The Gourmet Frog specializes in wedding cakes and can customize any special holiday cake. Food store with European sausages and other European products. Great selection of European delicacy. Great selection of Eastern and North Europe. Great quality and affordable prices. Our journey began in 1992, when Stanislaw and Halina Urbaniak opened their first grocery store Cicero Deli. Tremendous demand for our products allowed for creation of the second bigger branch in 1998 with a new name of Montrose Deli. Our excellent reputation, freshness and high quality of products and exceptional kitchen began to attract new customers not only from Chicago, but other states as well. In 2012 the biggest branch was opened, Montrose Food Mart And Deli located at Irving Park between Narraganset and Oak Park. The biggest until now store let us provide our customers with even more great products, delicious meals, alcohol and much more. European baking goods and pastries for any occasion! Cake shop with healthy and tasty products. Fresh Ukrainian and Polish food and dishes. Smoked pork, beef,salo, home made sausages. Order a cake for your special day! Montrose Deli is a polish grocery store with more than 22 years reputation for excellence, quality and value. Together with our newest store Montrose Food Mart And Deli we provide our customers the freshest and highest quality American and European products. At Harvest Fresh International, you will always find our deli case is packed with dozens of the finest deli products available. Our full- service deli featuring a never ending variety of premium meats and specialty cheeses Our goal is to ensure that our customers receive excellent quality products and phenomenal service.